Shield: Vert, issuing from the sinister an arm in armor, embowed argent, the hand proper, grasping a battle-axe point to chief of the second, within a brodur or. Crest: That for the regiments and separate battalions of the Army reserve; On a wreath of the colors (argent and vert) the Lexington Minute Man proper. Description: The use of the shield of the coat of arms of the 41st Armored Regiment, differenced by a border, indicates descent of the 778th Tank Battalion from the 1st battalion of that organization. The functions of the unit are symbolized by the strong arm grasping the medieval battle-axe, ready for action in full armor. 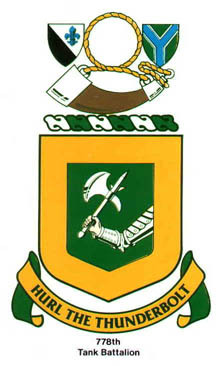 Green and white were the colors of the former Armored Forces; the border is yellow for the present-day Armor. Campaigns: Northern France, Ardennes-Alsace, Rhineland, Central Europe. Decorations: Service Company entitled to Meritorious Unit Citation for action during the period 8 February – 8 May, 1945 per letter Headquarters, 26th Infantry Division dated 13 June, 1945.